In the new role, Sberna’s responsibilities will cover strategic and operational planning initiatives, oversight of Cancer Patient Care Center data analytics, market intelligence and data reporting related to VICC’s designation as a National Cancer Institute (NCI) Comprehensive Cancer Center. Sberna joined Vanderbilt University Medical Center (VUMC) in 2004 in clinical enterprise strategic planning, and one of the early planning projects involved the successful move of the VICC Breast Center to Vanderbilt Health One Hundred Oaks. Prior to joining Vanderbilt, Sberna worked in Atlanta for healthcare consulting firms. “I was exposed to a lot of data sets where I learned about different physician practice structures and billing models and how to analyze the data. Because we had clients across the country, everybody had different systems and different state reporting requirements. That’s where I got the exposure and realized I was pretty good with data and seeing patterns in the data,” Sberna said. Retaining the NCI Comprehensive Cancer Center designation requires reporting vast amounts of data about cancer research projects, as well as how VICC is caring for underserved patient populations. “The patient population we serve includes minority patients who are representative of the number of cancer patients in our region. We’re also focusing on rural populations because we’re seeing a shift in the patient mix with more patients who live in smaller, rural areas traveling to VICC for their cancer care. Collecting and analyzing this data helps inform our leadership, as well as outside reviewers and our scientific advisory board,” Sberna said. 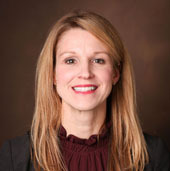 Sberna also assumed responsibility for Vanderbilt’s Cancer Registry, an office which is required to report new cancer cases, diagnoses and deaths to the Tennessee Department of Health. That data is shared with the Centers for Disease Control and Prevention (CDC) and NCI’s Surveillance, Epidemiology and End Results Program (SEER). VICC also is participating in the Center for Medicare and Medicaid Innovation Center’s Oncology Care Model (OCM) program that encourages practices to improve care and lower costs through an episode-based payment model. Practices participating in the five-year OCM provide treatment following nationally recognized clinical guidelines for beneficiaries undergoing chemotherapy, with an emphasis on patient-centered care. Enhanced services are provided to beneficiaries who are in the OCM to help them receive timely, coordinated treatment. Sberna expects this new payment model to gain acceptance and accurate data management is a crucial component for success. “Those kinds of bundled and episode-based payment models are not going away. Understanding that kind of evolution in payment, data analysis for monitoring progress and data reporting requirements for program participation is exciting,” Sberna said. She hopes that by streamlining data collection and reporting methods, many of VICC’s data programs will become more efficient.